Disclaimer: We were provided with a free copy of The Foolish King app to review. Opinions are our own. We're big fans of chess. It's an excellent way of developing the logical thinking needed for computer science. You have to think hard to plan ahead. I had an electronic chess game when I was a child which I loved and playing chess against the game was definitely one of the ways that I developed skills that were useful to me later on. My kids are 8 and 9 and both know how to play chess but are only occasional players. They recently introduced their cousin to the game and spent over an hour at the Garden of Heroes and Villains playing chess on a handmade wooden chess set. The app includes an eBook version of the Foolish King which is also available in hardback and as a Kindle eBook. The story is written in a fairy tale style which will feel very familiar to young children. Sir Mark developed the story when his own children were young. The book has an early illustrated chapter book amount of text. You could read it as a bedtime story to younger children. Confident younger readers would be able to read it themselves. I read it to my 8 and 9 year old's so that we could share it and I could get their opinions. 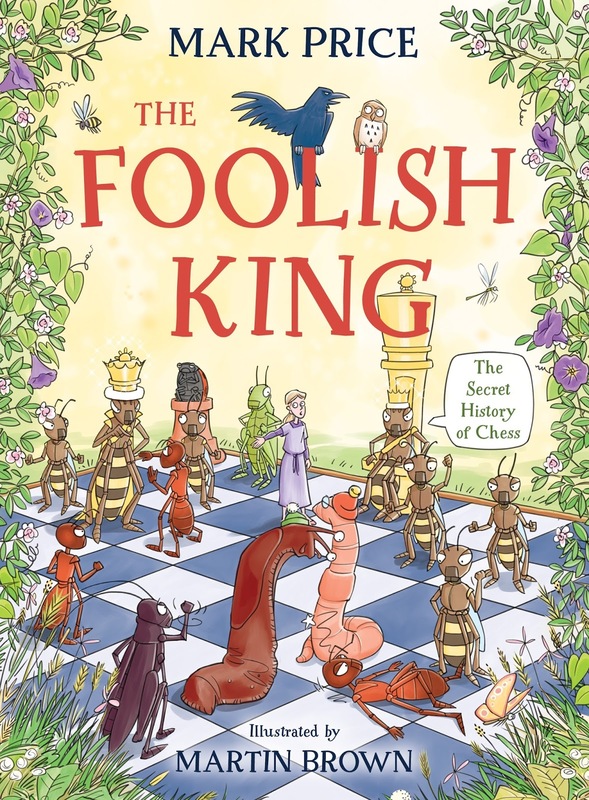 The story is a traditional fairy tale with a bad ruler and children who save the day and only introduces chess after a long build up so it's very much a full story rather than just an explanation of chess. My kids are 8 and 9 but have not yet rejected such stories and thoroughly enjoyed it, the fab illustrations definitely helped. I would say 5-7 would be a good age to introduce the book as a bedtime story. The book uses insects rather than the traditional chess pieces. My kids can already play chess so they didn't need this approach but it might help younger players. I can remember my kids getting confused by the different pieces and having a story to hang it on might well help with this. The app uses the same characters so there's no need to learn the proper names of the pieces in order to play the game. The illustrations for the book are very good. The illustrator Martin Brown whose work is very familiar to my children from the Horrible Histories series. They loved the cleverness of the cricket / grasshopper pieces which take the role of the knights. The latter chapters of the book take you through the moves of the chess pieces with puzzles to try. The puzzles were fun and would make a great first introduction to how chess pieces move. My kids found completing the puzzles a bit frustrating in the eBook version because they wanted to trace the paths with their fingers and kept accidentally turning pages. One of the things we really liked were the simple tips about playing chess, my kids definitely took these on board and used them when playing chess. I think they will remember them too. Obviously the hard back version of the book wouldn't have this problem. I could imagine reading the hardback as a bedtime story and then letting kids try out chess with the app the next day. My younger son picked up on and appreciated the environmental message that's also present in the story. While my older son, the history lover, was intrigued by the hints towards the possible real history of the game in China or India. The app is a full-featured chess game with one and two-player games and features for beginners. The game uses the graphics from the book so knowledge transfers straight over. There are some simple tutorials that explain how the pieces move. We really liked the guide feature which shows all possible moves when you tap on a piece. There's also a one-player mode where you can play against an Easy, Medium or Hard AI player. This definitely extends the value of the app beyond beginners. Hints are available which can help players develop their skills, but they are only available in some situations. The game could provide more help to players to understand what's happening in some situations. It would be good to have a visual indicator for check. In one game we ended up in a situation where a piece other than the king needed to be moved to get out of check and my son thought he couldn't do anything. A dialogue pops up instantly when check is achieved which obscures the board so the losing player doesn't see what happened until you quit the dialogue. It would be better if there was a change to the board and not a dialogue. We also couldn't find an explanation of Stalemate although the game does detect a Stalemate. It would be good to explain the situation, for example, there's no safe place for the King to move. These minor things could all be improved with an update and can be worked around with a parent who knows how to play chess or is willing to learn. I'd definitely recommend The Foolish King book and app to young children as their first introduction to chess. The app is available for iOS. The hardback book comes out on 1st September 2016 in the UK and is available to pre-order. The app includes an eBook version of the book, but the book stands alone as a nice gift. The app has been added to the list of constructive things my children are allowed to do in the evening if they don't fancy reading. I'll definitely be encouraging them to improve their skills until they can beat the game on the hard setting.